As 2006 draws to a close, a review of ConsumerAffairs.com's Scam Alerts archive shows that scammers have had a busy and -- we suspect -- lucrative year. Targeting the most vulnerable citizens and using increasingly sophisticated tools, most have been able to easily elude law enforcement as they pick their victims' pockets, sometimes even making off with their life savings. Scammers scored at will, generating instant cash using lottery and fake check scams. They capitalized on news events and pop culture to catch consumers off guard, and enlisted all kinds of emerging technology to perfect identity theft. 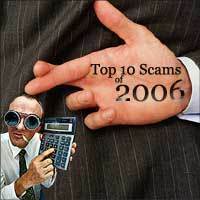 Here then, chosen from the roughly 50,000 consumer complaints we've processed in the past year, are the ConsumerAffairs.com Top Ten Scams of 2006. This scam, in which identity thieves "phish" for a consumer's personal information, are getting more and prevalent, due in large part to technological advances. The use of email now makes to increasingly easy for criminals to trick people into revealing account numbers, passwords and social security numbers. Unlike the 419 scams, which are perpetrated by out-and-out criminals, negative option schemes are run by otherwise legitimate businesses. Using pop-up ads on the Internet and extremely fine print on the back of sales tickets, consumers completing a transaction with their credit card are offered some free gift or enticement, not realizing their acceptance enrolls them in a travel discount club or affinity group of some kind, or commits them to a year's subscription of a magazine they most likely don't want. Again, this scam makes our list this year because of its potential to become much more widespread and to victimize vulnerable people. Illinois Attorney General Lisa Madigan recently warned consumers about this scam, alerting them to emails or letters that told them they had won tickets to a taping of the talk diva's show in Chicago, or had been offered a tour package that included a taping of the show. The communication asked for sensitive personal information, which, if provided, could allow their identities to be stolen.